At the recent Club AGM, trophies were presented for the Singles and Doubles Competitions. Winner of the Singles Competition was newly-elected Club Captain, Bill Strachan. The new-format Doubles Competition was won by Charles Henderson and Tom Mason who had accumulated the most points over the season in the experienced and less experienced player categories, respectively. 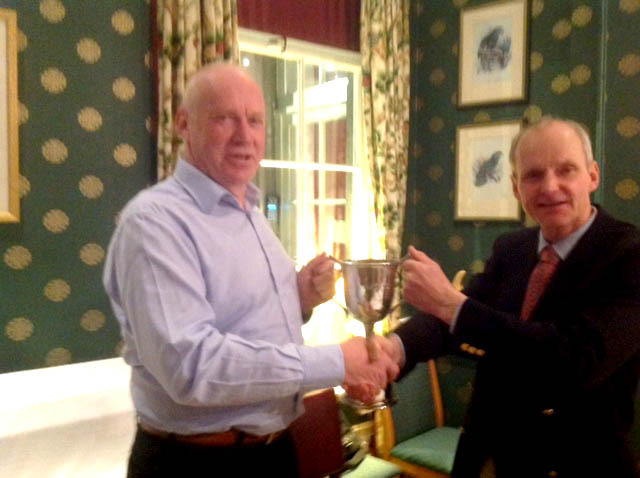 Congratulations to Bill Strachan on winning the Division A singles competition, a closely fought contest decided on the result of the last game to be played. 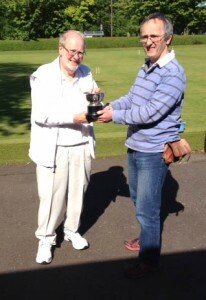 Well done also to Allan Bruce on winning the Division B competition, unbeaten in all his games. Full results can be viewed here. The Doubles competition where experienced players were paired with less experienced players was won by Charles Henderson and Tom Mason, Tom being the only less experienced player to win four games. Full results can be viewed here. 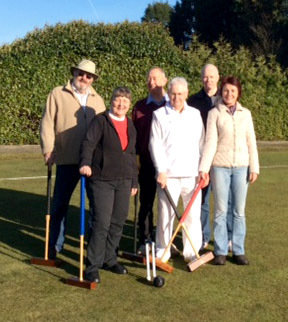 A group from ACCC were very fortunate in choosing a week of almost continuous sunshine for their tour of Croquet Clubs in the North of England. This event, again organised by Brian Clark with excellent support from the local organisers, kicked off on Sunday 27th September in Bamburgh with Brian Clark, Charles Henderson, Robert bell, Bill Strachan and our country member from Somerset, Bob Burnett, taking part. 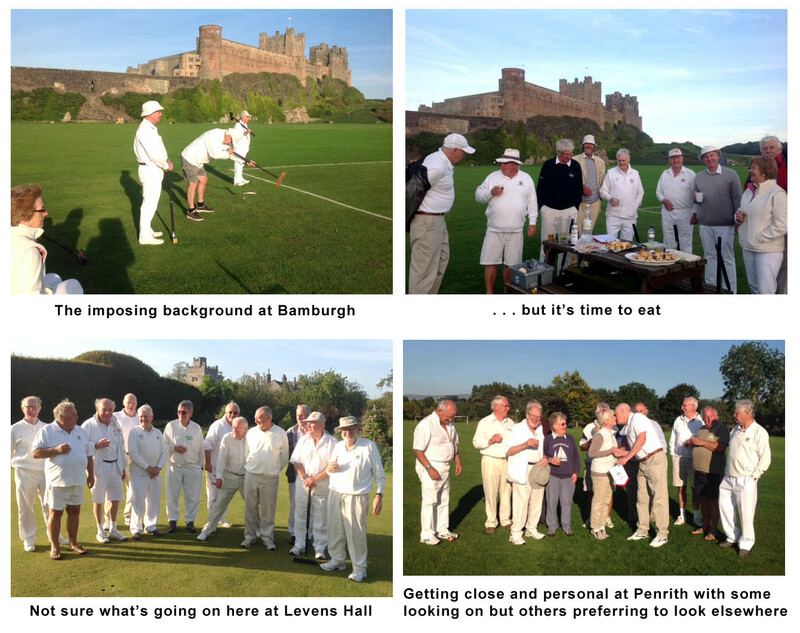 Simon Robins joined the group for the match against Keswick and all moved on to Levens Hall near Kendal for a match against Westmoreland Croquet Club and, on the Wednesday, to Langwathby for the final match against the Penrith and North Lakes Club. 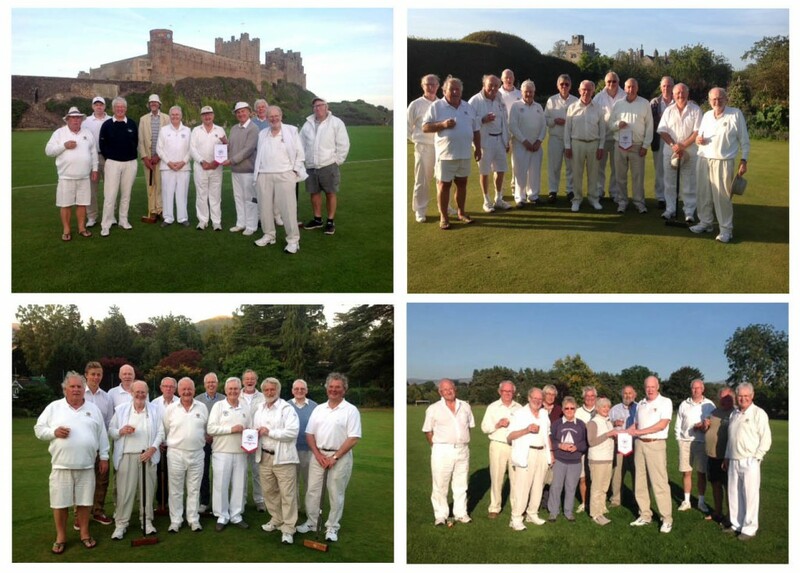 For the record, the results were a win, two losses and a win in that order but the more important factor was the enhanced interaction and friendship between the clubs, exemplified by the presentation of ACCC pennants as pictured below to (clockwise from top left) the Bamburgh, Westmoreland, Penrith and Keswick Clubs. All the ACCC players are very grateful to the North of England Clubs for their excellent hospitality and for helping to create such an enjoyable event. The SCA Aberdeen Tournament played at Westburn Park and Albury Sports centre on 12th and 13th Sept was greatly enjoyed by all and spirits were only marginally dampened by the inclement weather on the Saturday afternoon. 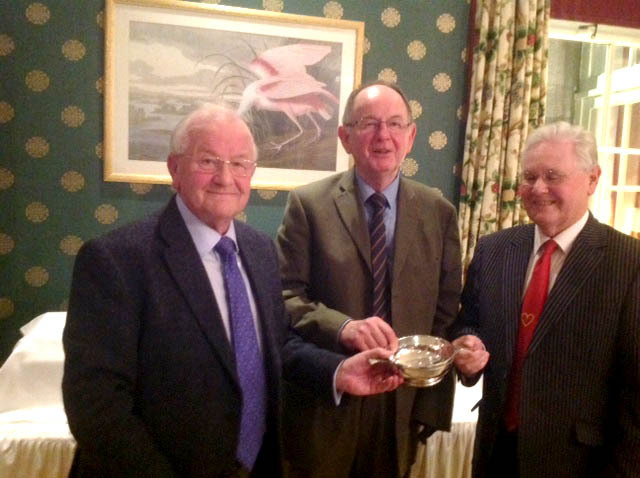 Thanks to the excellent combined organisational skills of Club Captain, Charles Henderson, and SCA Tournament Manager, Jane Morrison, the competition ran smoothly and the social aspects were enhanced by an excellent reception and dinner at RNUC arranged by Charles. Congratulations to Campbell Morrison on winning the event by narrowly beating Charles in the final. Jane’s full report can be viewed on the SCA website by clicking here. Additional pictures from the event can be viewed here. Members of the Aberdeen & Crathes Club have recently been helping to raise the profile of our club on the Scottish Croquet scene by taking part in National Competitions, although some of the results were perhaps not quite what we all hoped for! 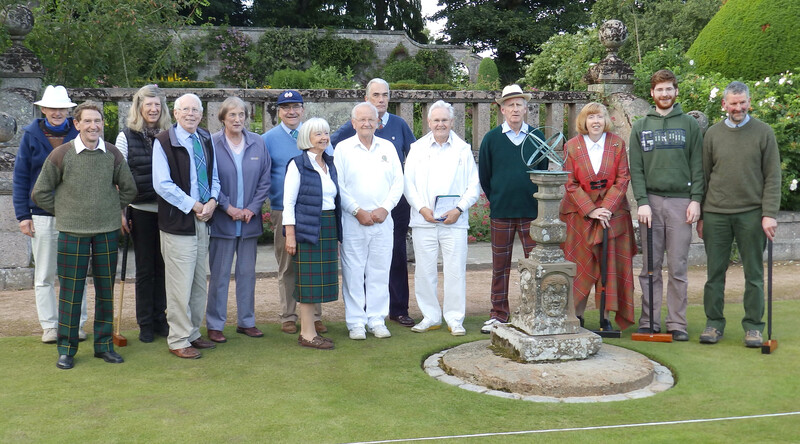 In a semi-final of the SCA Interclub 2015 held at Lauriston on 21st August, our Aberdeen 2 team comprising Bill Strachan and Charles Henderson lost to Hamish Duguid and Rosemary Saunders-Robertson, respectively, by +4 in each case, making a win for the Edinburgh team who now play the Meadows in the final. In the Walker Cup, an 18 pt handicap competition played at the Meadows on Saturday 22nd August, Bill Strachan again represented ACCC (Charles having to withdraw through injury). Bill got off to a great start beating John Campbell 18/12, lost a peg out battle with Alistair Malcolm 16/18, had to play too many long roquets against Rodger Binks 11/18 and had a lesson in how to use bisques from Lyn Gilpin who only used just 3 innings to win 18/3. Overall, an enjoyable and friendly event with the lawns in magnificent condition. Bill had to leave as the final round of games started with John, Roger and Alistair all possible winners, so look out for a full report on and results which will appear on SCA website. 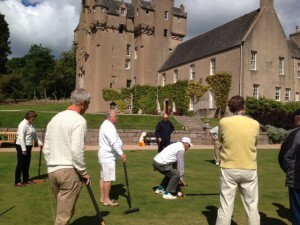 Gathering for a Golf Croquet Evening at Crathes on Thursday 30 July, five Clans competed for the honour of winning which on this occasion went to the Burnett Clan, with Clan Gordon in second place and Clans Hay, Irvine and Strachan taking up the places. The evening was enjoyed by all and this may now become a regular annual event. Pictured are the players with some of the club members present. Six teams entered this tournament held at the Glasgow Club and played on the magnificent lawns at Kelvingrove. “All played All” and the winning team was the Meadows, Edinburgh who won all five of their matches. 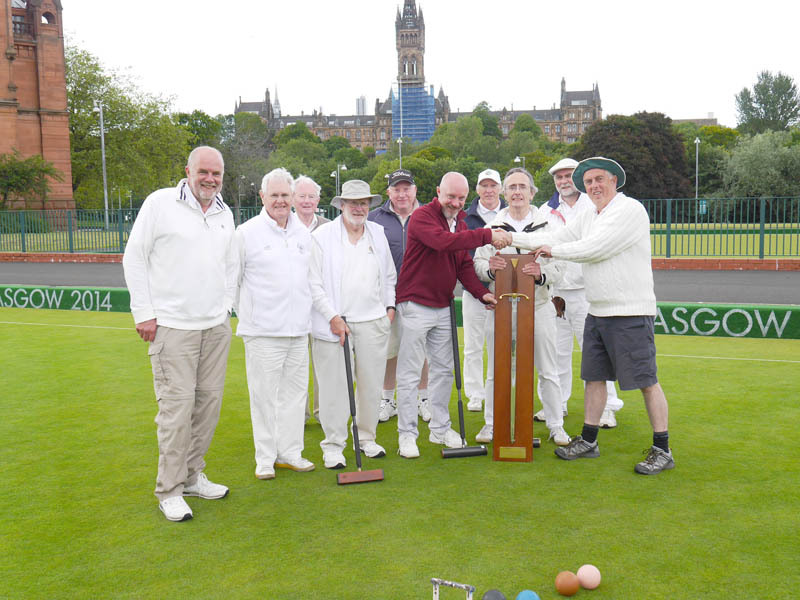 Aberdeen and Crathes Croquet Club, represented by Charles Henderson and Brian Clark, and Glasgow both won 3 of their 5 matches thus finishing ahead of Edinburgh CC, Auchincruive CC and Kinross CC. A report and full results will be on the SCA web site. Guess which ACCC player just missed a three-foot rush! The tournament format was five, one and a half hour, 14 point matches with Charles and Brian both experiencing high and low “moments”. The view of the ACCC team, and their opponents with their constructive comments on our performance, was that we need to improve basic techniques, use bisques better and in so doing have greater confidence we can beat lower handicap players. This was a most enjoyable event and well organised by Brian Durward of Glasgow CC and sometimes of Aberdeen and Crathes CC! After a spirited showing in the competition, ACCC have no longer have representation in this event as both ACCC teams were defeated by Meadows CC couples on Friday 10th July. Brian Clark and Charles Henderson with home advantage narrowly lost to Alan Wilson and Chris Martin 26-21 in a ‘first to 26’ match lasting 4h 10 min. 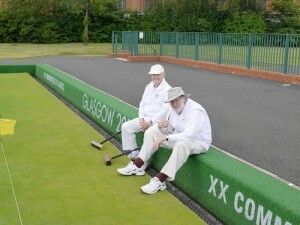 Brian Durward and BIll Strachan travelled to Edinburgh to face an inform Hamish and Janice Duguid losing 26-15. Both winners now face each other in the semi-finals. Played on the excellent lawns at Kelvingrove in Glasgow, this SCA tournament held on 4/5 July attracted 17 entries and was run under the Egyptian format. 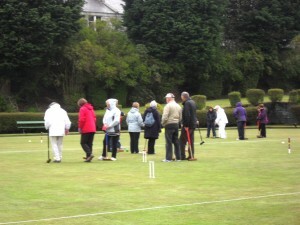 After the heavy rain ceased, the lawns were playable within 20 minutes. 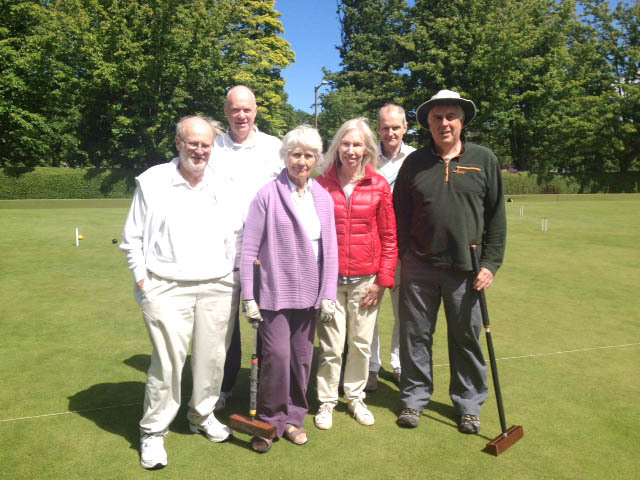 Of the 3 ACCC members who entered, Brian Clark, Charles Henderson and Bill Strachan, none unfortunately was destined to set the croquet world alight over the weekend, with Bill scoring 3/6, Brian 2/6 and Charles 1/6, so none of the trio will be troubled by the Handicap Committee. For report and full results see SCA website. A high proportion of Club members were able to benefit from the multiple coaching sessions run by Bob Burnett and Alan Pidcock on 11th – 14th June. With sessions at both Crathes and Albury, the programme successfully coped with all levels of experience. 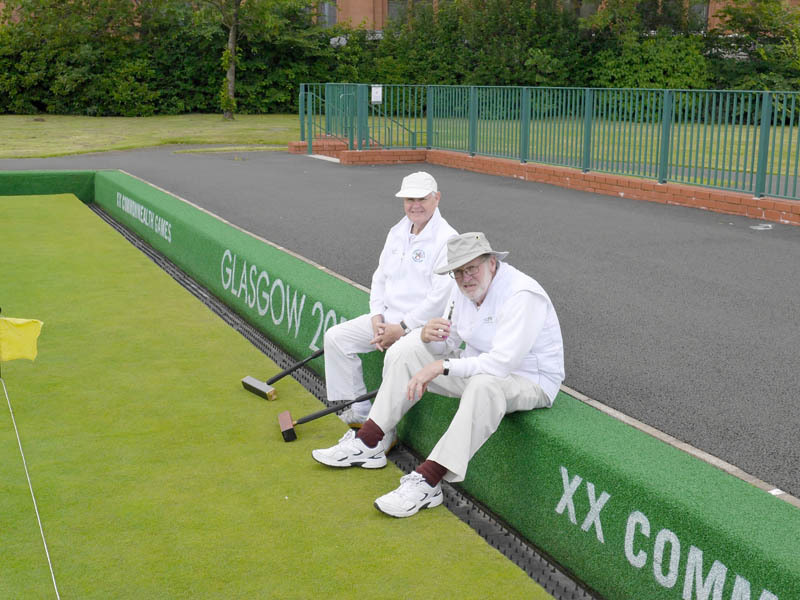 The Club is grateful to Bob and Alan for taking the time to visit and if they ever tire of coaching croquet, there is probably a future as a comedy double act! The group photo (right) is from one of the session at Albury and below Bob an Alan getting down to the job. 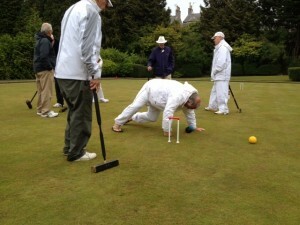 One of the major events organised by the Scottish Croquet Association is a competition for the Priestland Cup. This 2-day event with both Association and Golf croquet held at the Meadows in Edinburgh used to be limited to a tussle between teams from the East and West but, in just their second year of entering the competition, a team from the North comprising predominantly ACCC members has won this coveted trophy. A report with all scores can be viewed on the SCA website. 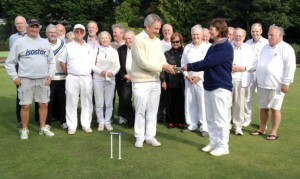 As commented by the Club’s SCA representative, Brian Clark, this success helps to raise the profile of the North in the Scottish croquet scene, augmented recently by a victory for Brian Clark and Charles Henderson in the SCA Handicap Doubles giving ACCC two teams in the second round, as well as an ACCC member, Simon Robins, winning the Kinross 11+ competition. Well done to Bill Strachan and Brian Durward on their win over Malcolm Smith and Rob Close from the Auchincruve Club in the first round of the SCA Handicap Doubles. The match was played on the excellent lawns at Kelvingrove (although the hoops were reported as challenging!) with Brian and Bill conceding 6 bisques. Both pairs offered each other several opportunities with failed hoop runs and missed roquets but when time was called both pairs had scored 23 hoops. Bill set up a good rush for Brian’s hoop with the added bonus of wiring it from Malcolm, who failed with his hit in. Brian completed the rush and ran the hoop to claim a narrow victory under the Golden Hoop Rule. Brian Clark and Charles Henderson will soon be playing their first round match and we wish then luck. 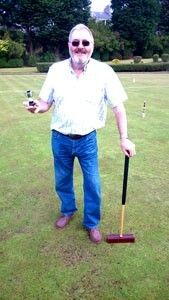 Pictured is Brian Butler as the first proud holder of “Sandy’s Cup” after a hard-fought Golf Croquet competition held at Albury on the afternoon of 20 May. Brian’s tenure as cup holder may, however, be relatively brief as the trophy is to be contested on a weekly basis. Over two weekends at the beginning of May the Have-a-Go Days proved to be very successful with around 40 interested individuals taking part. Unfortunately, the first event at Albury had to be called off because of the weather but, despite less than balmy conditions for the second event on Sunday 10 May (as evidenced in the picture), around 18 people attended over the day. 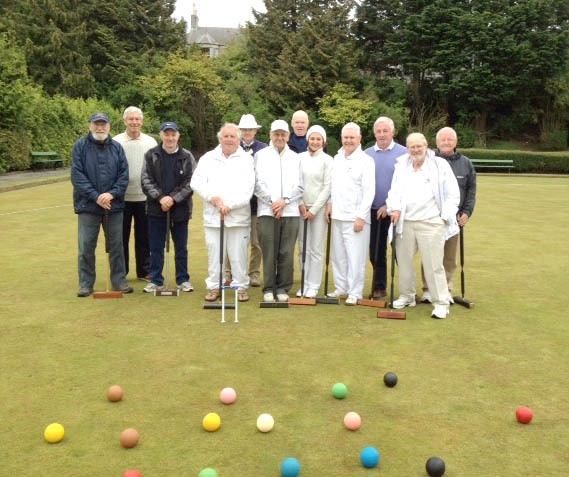 In this and the two similar events held at Crathes on the 2nd and 9th May, interest had clearly been sparked in the game which we hope will be translated into a further increase in membership of ACCC. The first handicap event of the season was held at the Meadows in Edinburgh on the 25/26 April: there were 14 entrants with handicaps ranging from –1.5 to 22. Charles Henderson and Bill Strachan took part from ACCC and had mixed fortunes on the Saturday. Bill won his 3 games against David Houston (26-10), Alistair Malcolm (26-11) and Robert Inder (26-15), Charles losing his 2 games against Alan Wilson (8-26) and Chris Martin (9-26). Sunday morning saw Bill struggling to match Saturday’s effort losing to Alan Wilson (the eventual winner) (23-26) and Charles losing to James Hopgood (10-26). The day ended successfully for Charles with a win against Lyn Gilpin (15-13). Full results and report on the SCA website. At the 2014 AGM, members approved the change in name of the Club to Aberdeen & Crathes Croquet Club, a move necessary both to recognise the increased use of lawns at Albury and to take advantage of potential funding opportunities. A change in name of course needed some changes in our website, and particularly in the pictures in our header sequence. We are grateful to Bill Strachan for organising these photos and to all those pictured here who braved a less than balmy day to make it look real!